We still have hope that specially trained service dogs will be in Orion's (and our family's) future. Orion tends to push pets away but during the first week of December 2015, he had a brief but amazing and funny interaction with a gentle, furry giant named Boss. Boss and his buddy, Katy. My sons both get off the TSD school bus at a neighbor friend's house who have kids at TSD as well. They live a quick 3 minutes away from us, rather than let my sons ride all the way to our house another 20-25 minutes later, the last stop of the bus' route, we pick them up at our friend's instead. 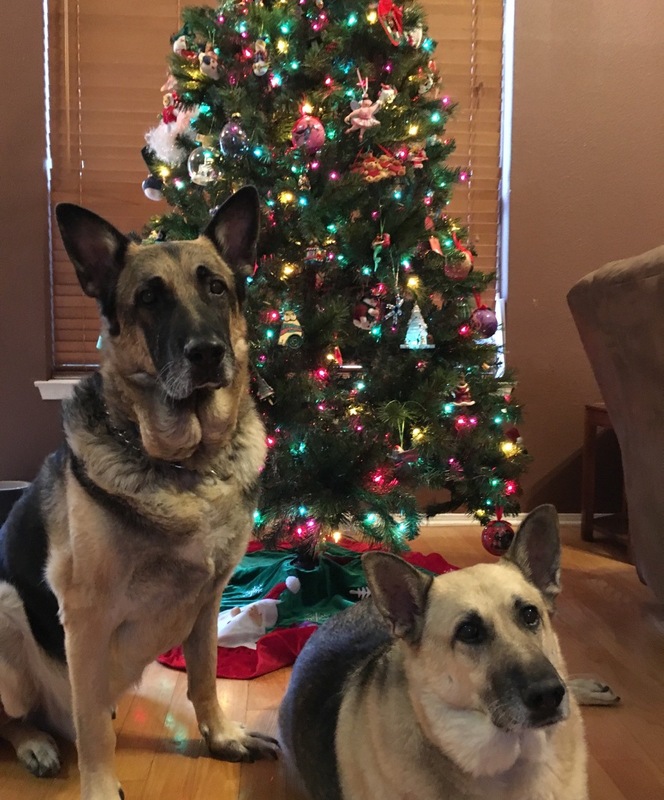 They have two German Shepherd dogs that "found" their way home to this family. They are Katy and Boss, two furry sweethearts, yet their barks sound like they belong to 10-foot tall prehistoric wild dogs behind the front door even if you jiggle the handle or lightly tap the door with your smallest knuckle. Boss is an impressively-sized dog with unfortunate hip problems and needs shots every two weeks to even manage to walk a couple hundred feet. One afternoon the first week of December, Orion was walked from the last step of the school bus toward the sidewalk where Boss and Katy were on leash with their "Dad". I invited Orion to pet Boss, his little hand rode on my hand (Hand-Under-Hand) as I pet Boss's head and back. Orion then left my hand and touched Boss himself, which is the miracle here since he's our shove-the-pet-away kid. Orion quickly and unexpectedly swung his right leg up onto Boss's back, I helped him up into a seated position. Orion sat up straight, straddling Boss in perfect balance and both his hands were touching Boss's fur. What a sight to behold! Sainted Boss did not object but we took Orion down anyway. Boss' mom was told that he was a special dog. This story adds to the emphasis he really is a special dog!